BB Chronological 26: BB #10 – Turtle Power Manga! 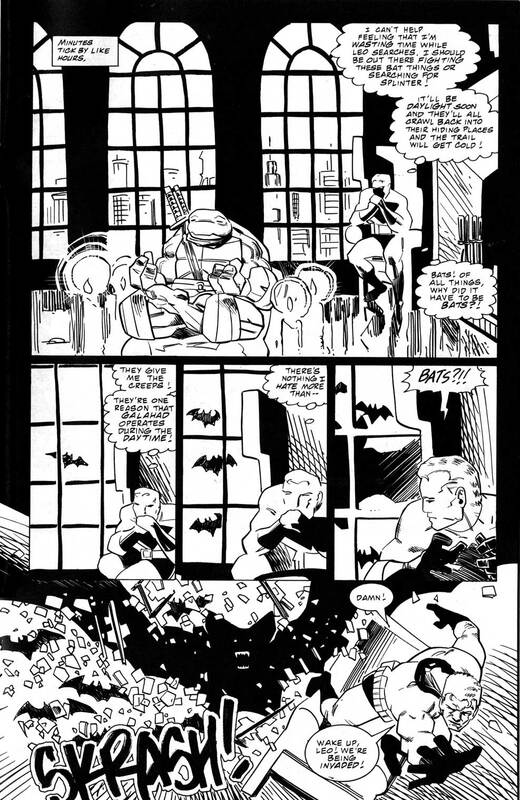 I had asked for and received permission to guest star the Knight Watchman in the pages of TMNT. 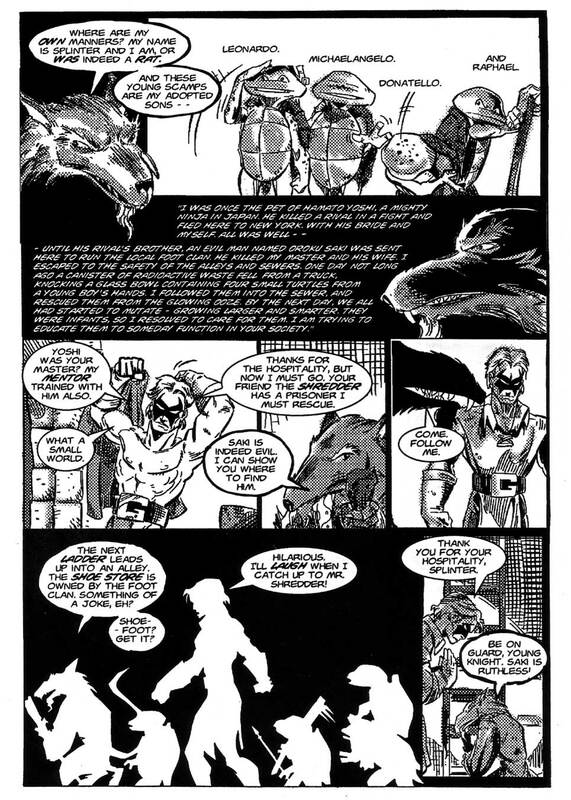 Kevin Eastman and Peter Laird were also kind enough to let the turtles appear in the pages of Big Bang. Thanks again, guys. May of 1997 was a pretty great time for me. 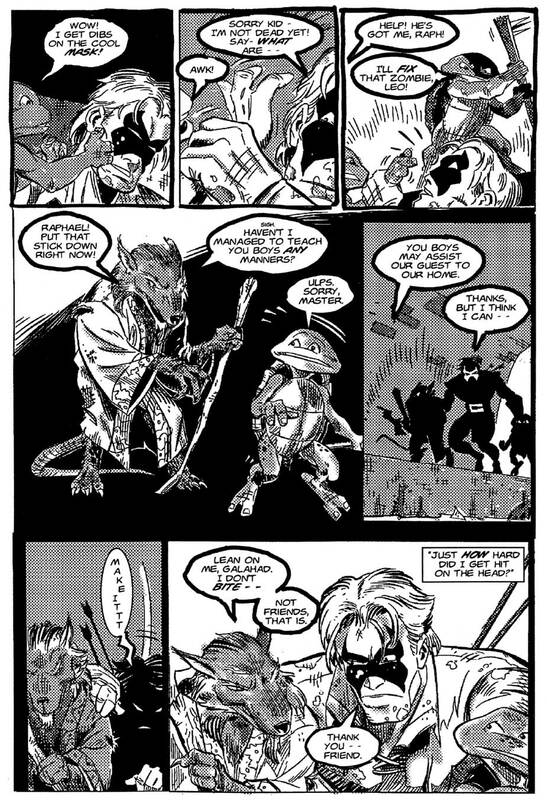 Big Bang Comics was still chugging away at Image Comics, where I was currently writing the Teenage Mutant Ninja Turtles for Erik Larsen’s Highbrow imprint. Plus we were getting set to issue the Knight Watchman: Graveyard Shift mini-series which had begun in our waning days at Caliber Press but had never been concluded. All was well. 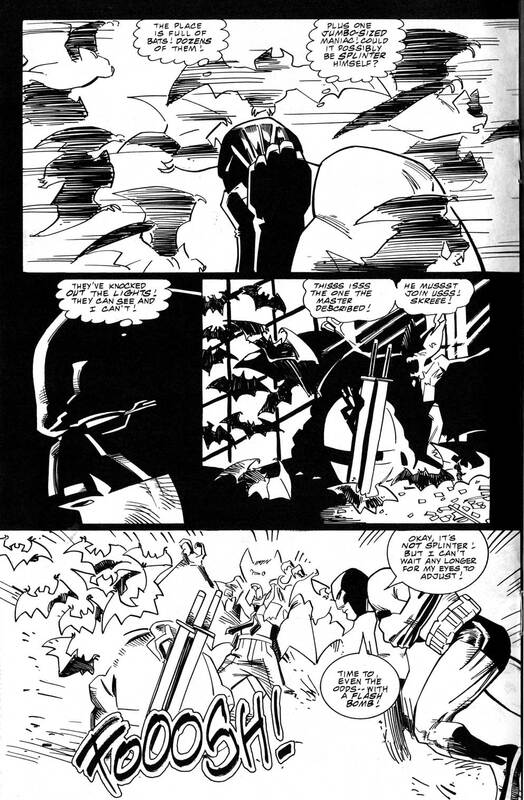 And it all intersected in May 1997 with a sort of crossover between Big Bang #10 and TMNT #9. A little background here. 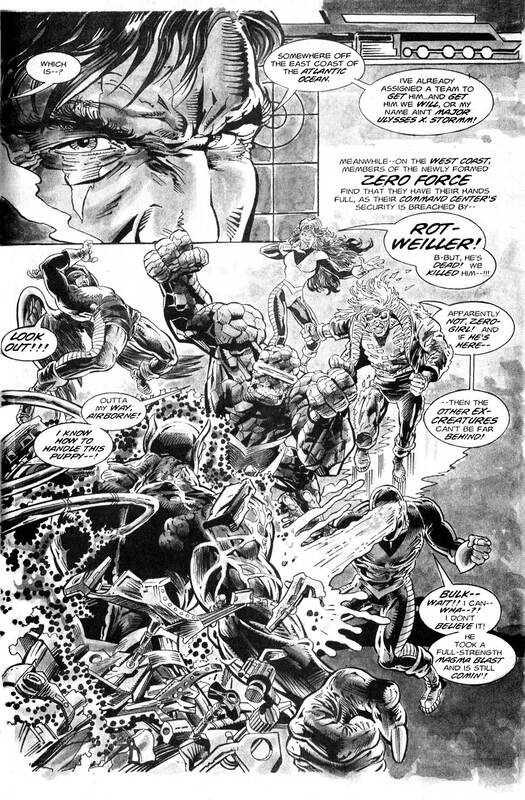 TMNT began life as a parody of a number of comics of the early 1980s, including Frank Miller’s work on Daredevil and Ronin. The Foot Clan was a play on the evil ninja gang the Hand. Et cetera. Our upcoming Knight Watchman: Graveyard Shift books were done as an homage to Miller’s Dark Knight Returns and Sin City titles. Ben Torres, the artist on KW: Graveyard Shift kicked things off with the wrap-around cover for BB #10 featuring Galahad, Splinter and the Foot Clan, with the Watchman looking on. It’s one of my all time favorite BB covers. What can I say – – Robin was my favorite character growing up and Kid Galahad was my homage to my hero. And I love Ben’s artwork! The story itself was told in the style of Frank Miller’s Daredevil work and set in the 1980s. No longer a kid, Galahad was grown up, married and tracking down a mysterious hired killer named the Headhunter who had murdered a friend of his. His search led him to a cheap motel room in New York City. Bursting in, he faces off against an unfazed Japanese crime lord that turns out to be a master of ninjitsu. Galahad uses a taser on him, only to discover that he wasn’t the Headhunter. A woman that Galahad had presumed to be a prostitute was. Their fight is epic, and takes them out to the street where they are surrounded by an army of ninjas – – the Foot Clan. Their leader, and Headhunter’s latest target was Oraku Saki, also known as the Shredder. In the melee, she escapes and Galahad is overwhelmed and dumped in a sewer to drown. Instead, he was found by four very young turtles and their master, Splinter, who patches up the White Knight, provides an antidote for the poisoned arrows in his back and sends him on his way. 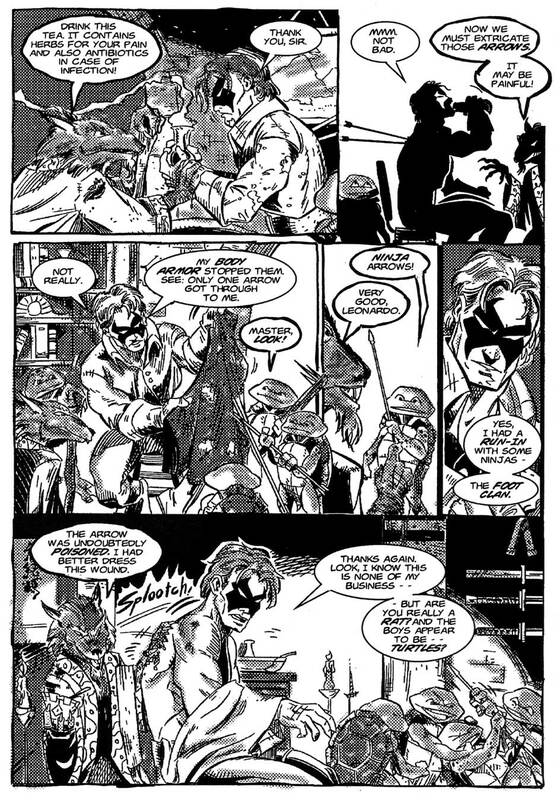 Galahad follows a trail of dead ninja to Foot Clan HQ, where Shredder has subdued Headhunter by breaking her fingers and severing the tendons in her hand. Galahad insists on taking her in as his prisoner, but underestimates Headhunter again and she escapes. The story was penciled by Clarence Burk and inked by Jim Brozman and has a nice 80s Frank Miller feel, especially the interior shots with backgrounds lit by venetian blinds. 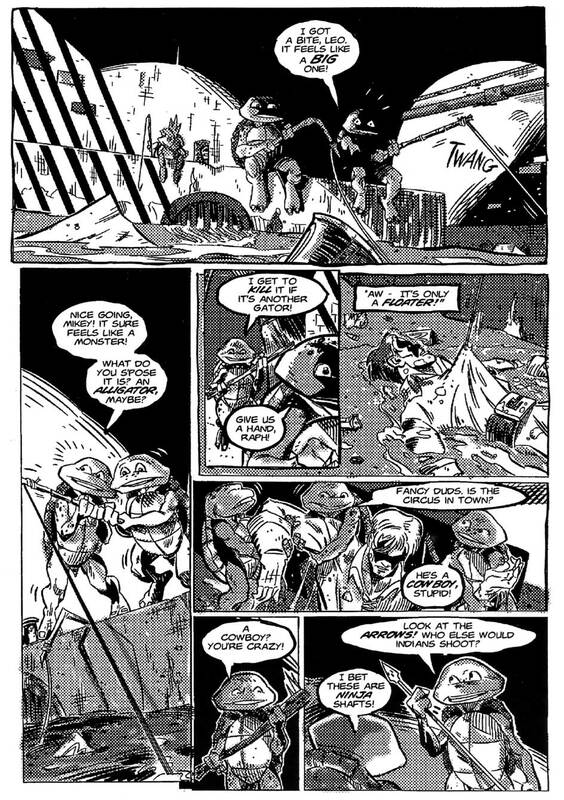 I have always been especially proud of the TMNT segment with its extensive zipatones to give that section a murky feel. 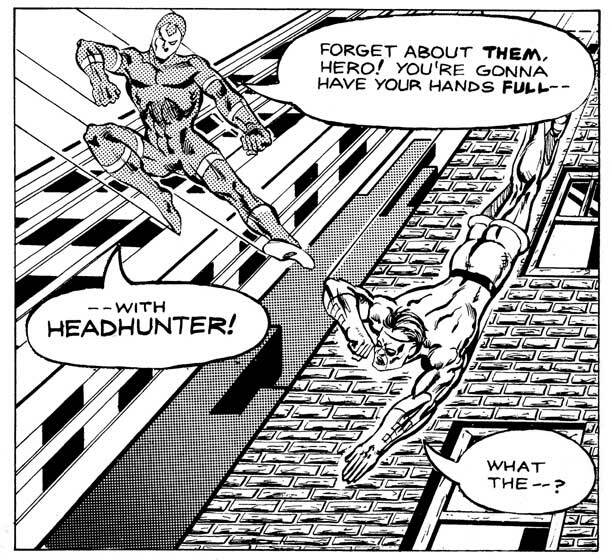 Just for the record, Headhunter was a tip of the hat to the first comics story that Chris Ecker and I had worked on. 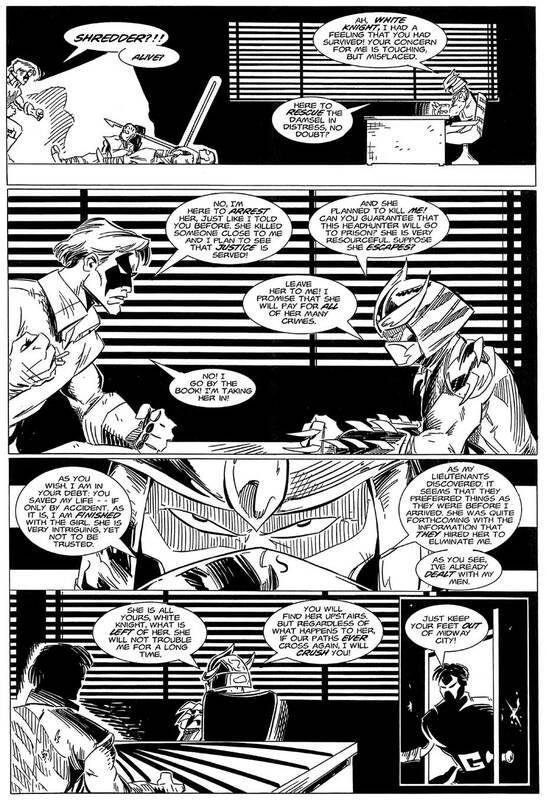 A villain by that name starred in the Crusader/Sentinel story from Megaton #1. 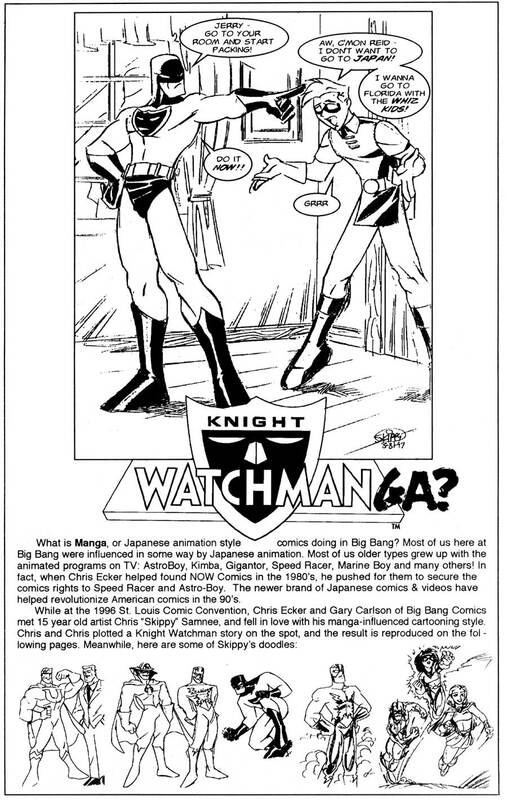 The Crusader later morphed into the Knight Watchman which led to the creation of Big Bang Comics. Also, there’s nothing in this story that spells it out, but my intention was that Headhunter would have been Pimiko’s mother over in our TMNT continuity. 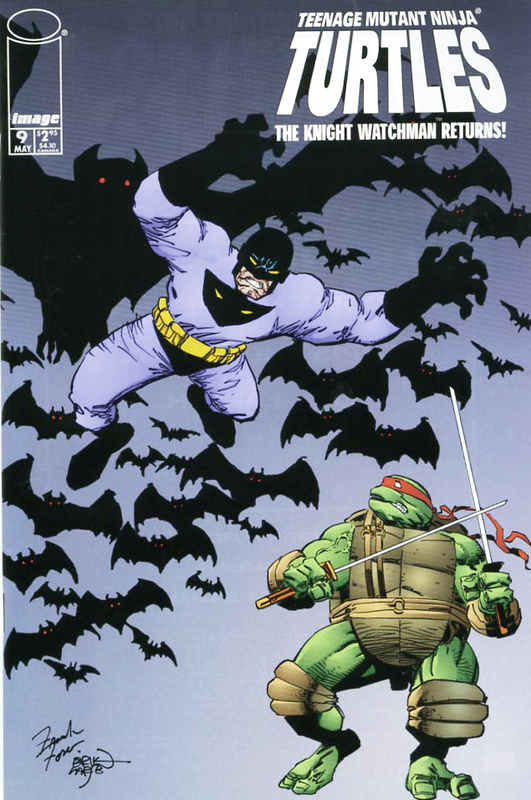 Switching over to Teenage Mutant Ninja Turtles #9 which takes place 10 or 15 years later, Leonardo has arrived in Midway City, where a “bat plague” is changing normal citizens into bat creatures. Leo figures correctly that the plague is being passed on by his Master Splinter, who had been mutated into a giant bat by synthetic mutagen. In Midway City, Leo runs into Galahad, who has assumed the Knight Watchman identity. They track down the bats’ HQ and release a gas bomb containing the antidote to the rabies which Splinter has passed on to his followers. We had a lot of fun with the bat imagery in a KW story with pencils by Frank Fosco, inks by Andrew Pepoy, and letters by Chris Eliopoulos. Cover inks were by the boss, Erik Larsen. Back in BB #10, another Knight Watchman story appeared. 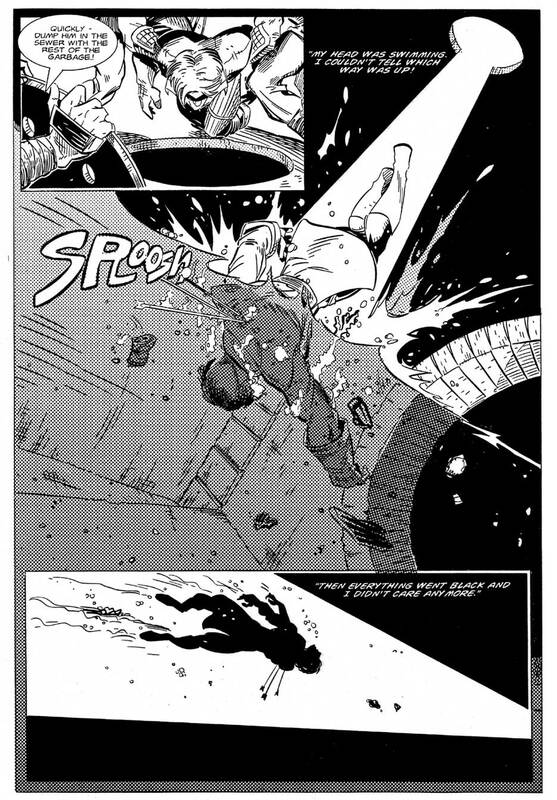 It was a real departure for us, in that it was very influenced by the Japanese manga comics. Chris Ecker and I had met a 15 year old artist at a St. Louis Comic Convention the year before. His name was Chris “Skippy” Samnee and we were knocked out by his talent and enthusiasm. 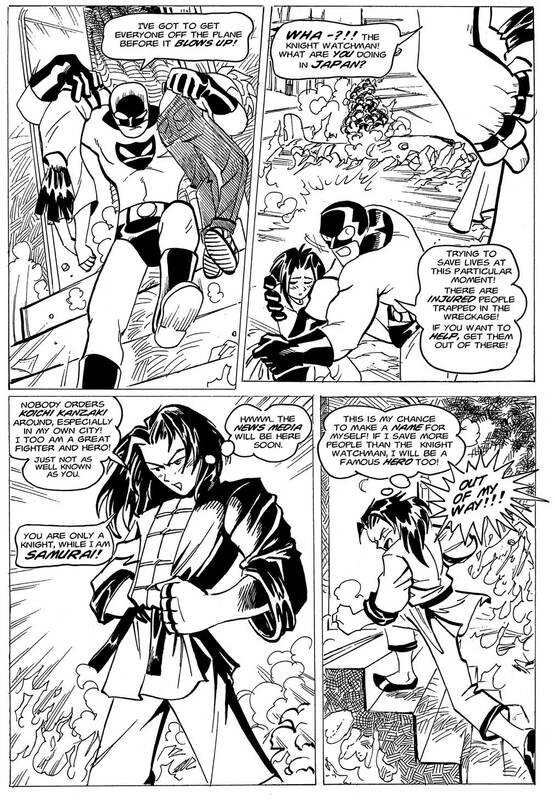 He reminded us of another young guy we’d worked with ten years earlier named Rob Liefeld. Knight Watchmanga was plotted by Chris and Chris that day. Chris Samnee drew it up soon after and I dialogued it. The story took place in Japan, where the commercial airplane that Reid and Jerry Randall were riding in crash lands in a city. I believe it was Chris’ first published comics work. His style evolved into a more mainstream style, and he drew another story for BB a while later in the Whiz Kids Special. 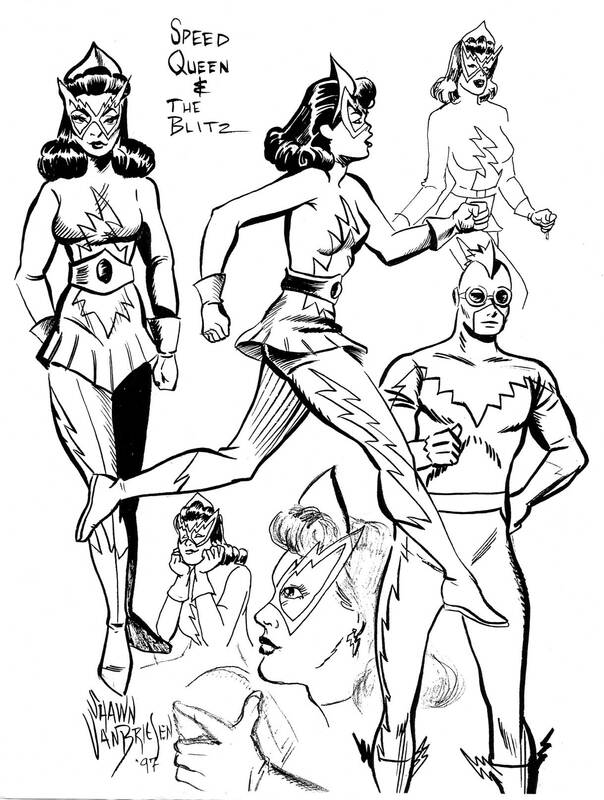 Then it was off to Marvel Comics and the big time for Chris Samnee, although I still tend to think of him as Skippy, and have a folder full of fun drawings and sketches by him. 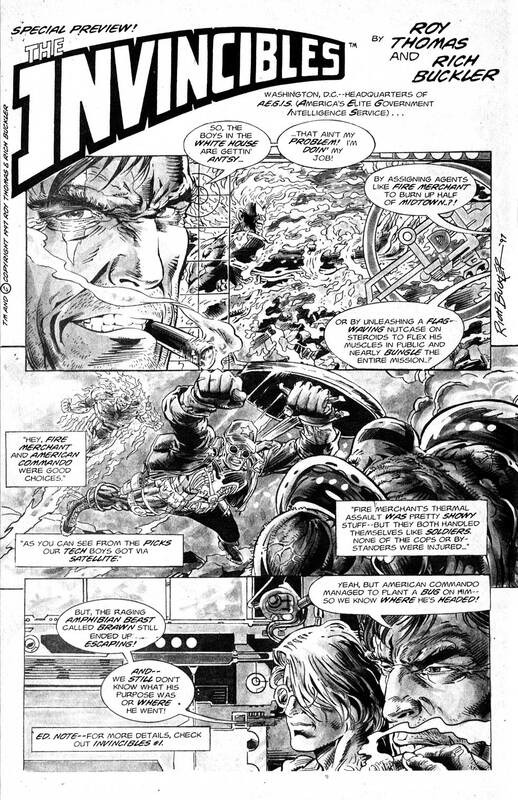 Next up in Big Bang #10 was Speed Queen’s Strange Revenge, a two page prose piece by Terrance Griep, Jr. starring the Golden Age Blitz. In it, the Blitz and his girl friend confront Boss Nero, who has been stealing uranium. It was Nero who had shot Louise Darnell years earlier, necessitating a blood transfusion from the Blitz that turned Louise into the Maid of Motion. Featuring spot illustrations by Shawn Van Briesen, the Blitz kept side-tracking Speed Queen, fearing that she might seek revenge on Nero. Instead, he is amazed when she thanks him for changing and improving her life. The last feature in BB #10 was a preview of the upcoming comic book The Invincibles by Roy Thomas and Rich Buckler. Rich was a favorite of mine, having watched him progress from some Robin back-up stories to the Avengers and eventually creating Deathlok. Rich had done a 3 pager for Big Bang #4 and was doing a cover for the upcoming Savage Dragon/Big Bang storyline and it was fun to be able to be able to do him a favor. It was a fun book – – well worth tracking down. Big Bang Comics and related characters are © and TM Gary S. Carlson and Chris Ecker. TMNT and related characters are © and TM Viacom International, created by Kevin Eastman and Peter Laird. The Invincibles are © and TM Roy Thomas and Rich Buckler. 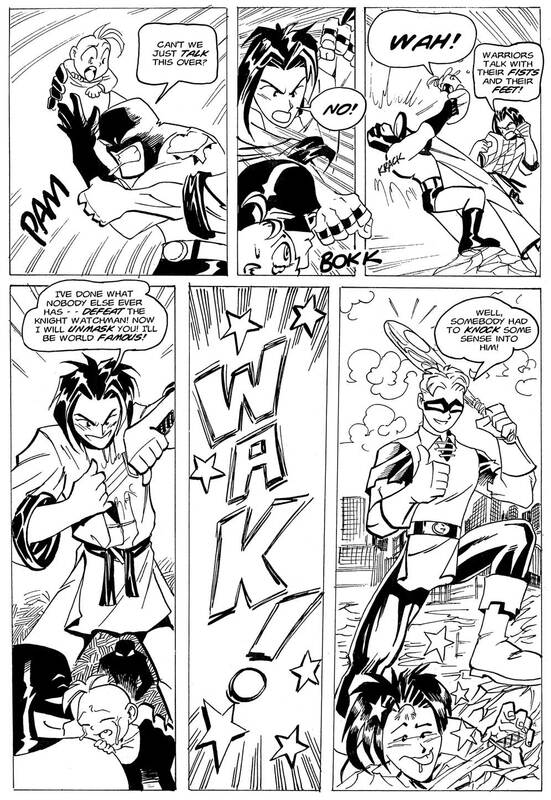 Koichi Kanzaki is © and TM by Chris Samnee.